Monday night mayhem. An evening of crushing cacophony to macerate your ear drums. 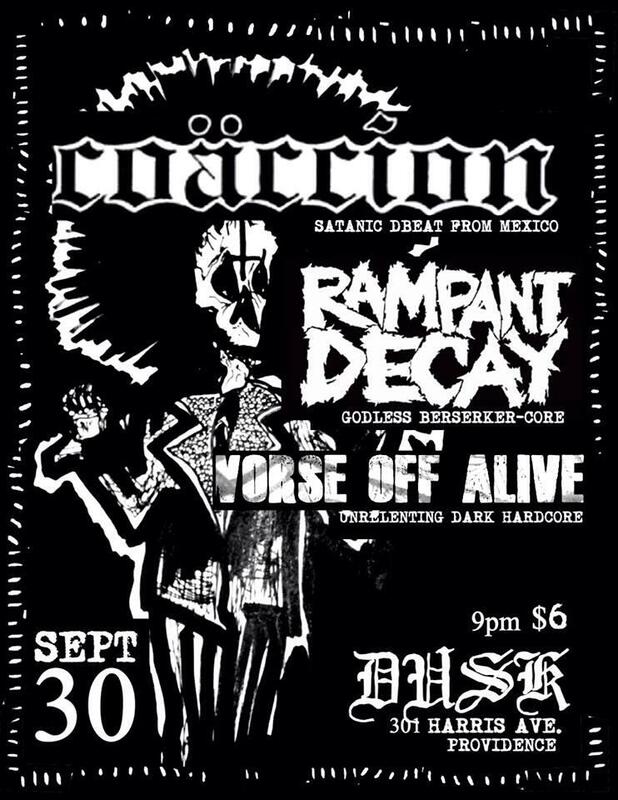 CoaccionÂ Pulverizing D-beat/metal on tour from Tijuana, Mexico. Heavy, Heavy, HEAVY! Ex – Discordia! Rampant DecayÂ R.I.’s own belligerent t(h)rashy grind 3 piece -Â PATAC Records. Worse Off AliveÂ Blistering heaviness from Providence. Ex Brain Shivers & Jesuscentric. SpinachÂ Abrasive fastcore with members of David Carradine & Insufferable Ingrate.